If your marketing campaign still resorts to flyers, magnets and key chains for brand exposure, you need a 21st century touch to boost the prominence and professionalism of your business strategy. Promotional USB flash drives are the precise marketing tool that can give you the results you're searching for. 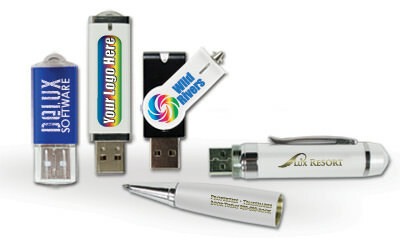 So why choose a custom promotional drive? The device's perceived value will gain instant bonus points with your target audience. In an era where digital storage is close to mandatory and flash technology is paving the way to faster, higher capacity solutions, a custom USB drive is a hot commodity. 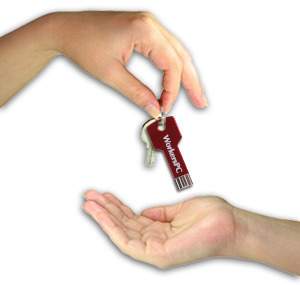 If you distribute a branded flash drive to potential customers, it sends a message with a greater impact. It suggests that the customer's business is worth the extra effort to you because you are willing to invest in a practical, useful item (an investment that is worth the price while still maintaining affordability). The perceived value of a promotional USB drive is further emphasized by the fact that it can easily and quickly store invaluable content to users—children's photos, your favorite videos, songs with special meanings and precious documents. When potential customers think of these multimedia items, they will also think of where they are stored: on your branded flash drive. This in turn creates a positive impression of your business with just a simple digital tool. Another reason to promote with custom USB flash drives is for their user practicality, something other marketing gadgets lack in comparison. For example, a magnet will only stick on your fridge or a similar surface and grasp a few papers at most. Promotional pens run out of ink and branded clothing items like hats and shirts alienate customers who don't like the specific style chosen. In this case, they will not end up wearing the clothing, much less remembering your brand. The cost is also comparable to bigger ticket clothing items, but you're not confined to style. While items like pens and magnets are cheaper, you will likely get comparable results. With flash drives, you take the initiative to associate your business or brand with an item of quality and technological value, as opposed to an item that is more limited in its originality, longevity and user options. 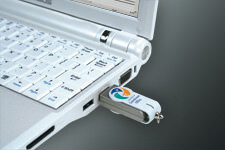 A custom branded USB flash drive is useful for any customer in any setting. It also implies that your brand or message played a vital role in a customer's daily life. The flash drives can be used to not only store personal photos, videos or songs, but also to load class projects or homework as well as business presentations. With the inherent portability of a promotional USB drive, it can also increase the number of places your company or brand will be seen by others, places that traditional advertising hardly touches like certain offices or libraries. Your customer will be the vehicle to your promotional flash drive marketing; wherever they carry it or use it will only enhance your brand's prominence. Promo America's goal is to provide you with such comprehensive electronic marketing tools. Their value, visibility and practicality ensure that your target audience will never forget your brand. Register Today! or Shop custom USB drives!